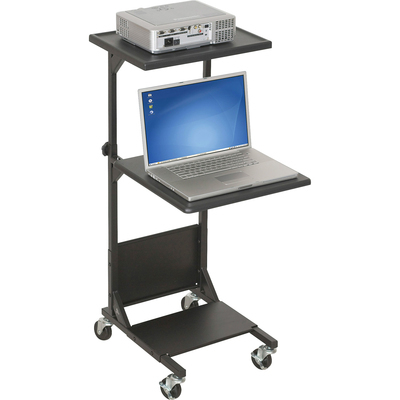 Height Adjustable Lcd Projector/Laptop Stand Offers A Top Platform That Adjusts From 41-1/2" To 47-1/2" In Height. Middle Platform Extends Outward For Easy Access To Laptop. Lower Wrap-Lock Stability Panel Provides Storage For Supplies And Accessories. 3" Casters (Two Locking) Deliver Mobility And Stability.. Height Adjustable Lcd Projector/Laptop Stand Offers A Top Platform That Adjusts From 41-1/2" To 47-1/2" In Height. Middle Platform Extends Outward For Easy Access To Laptop. Lower Wrap-Lock Stability Panel Provides Storage For Supplies And Accessories. 3" Casters (Two Locking) Deliver Mobility And Stability. Top platform adjusts in height from 41.5" to 47.5"